GOING FORWARD…..one significant Canadian CEO Academy step at a time! I would agree that pedagogy is the best starting point. Without a doubt, improved pedagogy will have the greatest impact on student learning. In BC, we are a victim of our own successes. We have an outstanding education system with passionate, qualified, and experienced educators. Unfortunately, that has resulted in our system clinging to ‘quality curriculum’, ‘safe and supportive learning environments’…and so on. It’s not a bad thing at all, but is does present some barriers to change. Focusing your starting point with pedagogy makes sense, as none of us cling to bad pedagogy and changing pedagogy often fits within our system structures. As improved pedagogy spreads throughout the system, it will become easier to shift/change/or revise some of the other system drivers. Great post. Great conversation starter. It will be interesting to see how the pedagogy shifts (or doesn’t) with the changes in curriculum. As a provincial system curriculum is the one of the six they can have greatest influence over along with governance. Our local challenge is to focus on the areas we can most strongly influence – practice, assessment and community engagement. Thanks for the comments Don. Yes, no doubt that so much of the interesting work over the last several years have been about giving students increased voice, choice and ownership of their own learning. In BC we are trying to do this through curriculum. I wonder if we looked at these six shifts, and wanted to identify which one would have the greatest potential on increasing student ownership which would we choose. I would lean towards either pedagogy or assessment. I’m thinking of a spiral approach similar to the one used in Spirals of Inquiry (Judy Halbert and Linda Kaser, 2013). For example, I might start with exploring a professional learning opportunity, and then put it into practice with digital technology in the classroom and a shift in the design of the learning space. I may then tap into the talent of my PLN and co-develop an assessment rubric that looks at an interdisciplinary unit of inquiry, and (while teaching digital literacy skills), survey the students to find the best social media space to share our learning. I see these drivers of educational change as interdependent. A question I have is, Can we involve parents in the assessment process? It may help make the self-assessment piece more relevant and individualized if the conversations around learning shifted from home to school, and back again. The addition of Judy’s and Linda’s work is important. I had an interesting conversation following up on this topic about assessment for learning. I actually see AFL as pedagogy not assessment so in my mind this is part of what we lead with. And you are very correct – there are no ways to really pull the drivers of educational change apart. I am seeing some nice work from some teachers using FreshGrade as a tool to engage parents in assessment. The key, I think, is making it easy for parents to engage in the process. If it is too complicated parents will not participate. I love the discussion that you have raised here. And I absolutely agree that it does need to start with shifting pedagogies. However, one of the issues I see is that out of all the shifts you defined, pedagogy is the one change that I believe occurs implicitly, as our society evolves. Unlike curriculum, for example, educators who are actively engaged in their student’s lives and in tune with their student’s individual needs will naturally adapt their approach and even philosophy on education on a continual basis. And these experiences are a catalyst for their constant growth as educators. Every day I find myself questioning and reflecting on what I can improve upon, especially on days when I have the joy of encountering a unique learning style in a new student. People do not even need to bring attention to it and no one need speak of it; there will always be a silent force that pushes pedagogy forward. I think our limitations as educators are inherent to the fact that this is the only element of our education system that is organic. The remaining process, understandably, and sometimes unfortunately, is regulated, to the point that I believe we experience a lag between these shifts in pedagogy, and the implementation of systems that answer to those shifts. So what do we do when, as you suggest, pedagogies change first, but the system adapts too slowly? I presented at a conference last year about this very issue regarding the implementation of technology as a learning platform. Embracing technology has the potential to be a wonderful development in the world of education. But currently, the execution often falls short. I regularly see students who are blessed with the opportunity to discover how great a tool technology can be for learning, who are instead frustrated with the disconnect between how they are learning and how they are assessed. Students today all too often receive mixed messages between progressive pedagogies and archaic systems, and I have observed that this can be aggravating enough to turn a student away from pursuing an educational opportunity altogether. I see that as an unacceptable casualty of our current predicament. And if what I have noticed in myself applies to most educators – if our pedagogies are indeed constantly evolving, and when any changes to the other drivers that govern our education system only happen in artificially imposed, and in my opinion, overly-spaced-out increments, then will we always be playing this kind of catch up? Will we ever realize the potential of our innovative methods if they are ineffectively and inefficiently applied to traditional templates? And will these limitations always result in some of our learners being left behind? Thanks Nadine – this is a real challenge. If we make great strides with one of the drivers, the system feels disconnected if the other parts (assessment, curriculum etc.) are still in the old world. We do seem to have something interesting happening now in BC as the curriculum has pushed out and it is helping guide and shape assessment and pedagogies. We also have a provincial government that has loosened its control and opened up the governance of education to allow greater flexibility. I think the next key piece in BC will be what happens with large-scale assessments – how will new versions of the FSA and Provincial exams align with the other shifts -they need to! This post has me thinking about upcoming “training” for teachers around the new curriculum. While talking about the what of our transformed curriculum we can’t forget the how. And if we don’t balance the time talking about shifting pedagogies with shifting curriculum, how will this impact implementation of new curriculum in our province? Absolutely. The more I think about supporting the new curriculum the more I think it is about pedagogy and assessment. 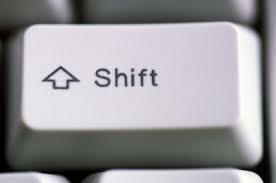 We can all get our head around shifts in content but it is the other required shifts that are more challenging. Unless we are talking about the other 5 shifts – we won’t see the full benefit of the new curriculum. I enjoyed your very thought-provoking and timely post given our onslaught of new curricula here in BC. The pragmatic part of me believes that this shift will not happen until changes in assessment and reporting require teachers to collect different types of student progress. For example, if mathematics teachers were required to report on progress around Standards of Mathematical Practices (see http://www.corestandards.org/Math/Practice/) then pedagogical practices would shift more dramatically, in my opinion. Until then, the cynical part of me feels that content will remain king and educational transformation will be slow. Thanks Blaise – I think this is particularly true as one moves up the grades. It will be very interesting to see what the provincial government does with FSA style exams and provincial exams in the era of new curricula. This is an opportunity to align assessment with curriculum. And yes, the new reporting order will also be interesting. I think we will continue to see the greatest shifts up until about grade 9. I am having the chance to work with our post-secondaries around the grade 10-12 program and we need to work with them on changes, and thus will need to be slower to get it right. Great discussion and one that needs to be more public. The most difficult part of working in a school, that has focussed on changing the way we “do” school, is convincing the public/parents/educators that our pedagogy is good for education. For the past four years we have been knee deep in that struggle. However, I do see the light at the end of the tunnel and I also agree that the first step should be a shift in pedagogy. Our staff and students are committed to developing a strong, collaborative community where all perspectives are encouraged and valued. We use project based learning, daily physical activity, weekly collaboration, town hall meetings and partnerships to create opportunities for students to develop competency in the Personal Awareness and Responsibility profile. As a school community we endeavour to promote and support all students to self advocate and to advocate for others. Developing this “student ownership” is what I feel has helped the most in this struggle with the public/parents and other educators. It is the voices of the students and parents who have experienced our campus that have helped shift the public opinion on our pedagogical methods. No matter how many times or how articulate we explain and promote our school, it isn’t until the students speak that people actually listen. Shifting Pedagogies involves: Shifting Learning Environments and Shifting Assessment – all three go hand and hand – at least that is what I have experienced. The pedagogical shift will slowly lead to a shift in Governance, Citizen and Stakeholder Engagement. Thanks Sheldon – I appreciate your additions to this conversation. It is interesting in BC that provincially efforts are being made to shift governance (policy) and curriculum to help speed up the changes. I think our local (district and school) responsibility comes down to pedagogy, assessment, and environments. As a district I know we have used shifted learning environments to accelerate shifts in practice and assessment. I often think the biggest shift from investing in technology is the shift it makes in how we teacher. Good discussion – thanks for the thoughts!